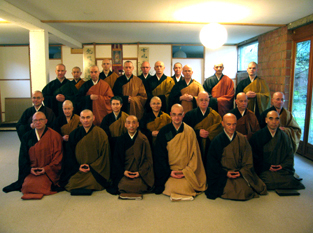 International Soto Zen educational activities started in 1967, when Taisen Deshimaru initiated programs centered on zazen in various European countries. His base was in France, where the Soto Zen Administrative Office of Europe was established at the temple Bukkokuzenji, in Paris. At the time, he became the first kaikyo-sokan (known today as the kokusai-fukyo-sokan) and trained many disciples. After his death in 1982, some of his disciples continued their activities at the Association Zen International (AZI) founded by Taisen Deshimaru. Others became independent and went Japan looking for a new master. Others who had always wanted Japanese masters, traveled to Japan for several years of training. Still others who had trained at American Zen centers set up Zen Dojo in Europe. 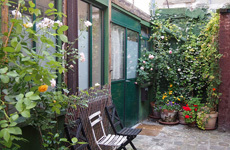 During the 40 years since its inception, Soto Zen education in Europe has followed a digressive path leading finally to the reestablishment of the Soto Zen Buddhism Europe Office in June, 2002. Today local leaders working in harmony devote themselves sincerely to the True Dharma and propagate the zazen-centered teachings of our two founders. The more than 300 Soto Zen facilities in Europe include temples accommodating resident training and Zen Dojo where more than 200 monks registered with Soto Zen are actively at work. 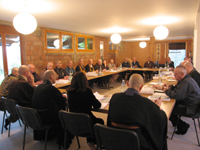 The Soto Zen Buddhism Europe Office performs a number of functions to promote exchanges among these temples and Zen Dojo. For instance, we conduct seminars and conferences, compile teaching materials, publish the news letter entitled Hoyu (Dharma friends), sponsor lectures and dharma talks. According to a report compiled in January, 2006, by the conference for priests working for international education, full members in temples and Zen practice centers outside Japan number more than 15,000 (not completely verified). The total is higher when supporting members are included. There are 455 registered Soto priests and 520 temples and practice centers. This vigorous overseas growth and the world-wide acceptance of the teachings of our two founders are likely to continue in the future. Nothing similar can be seen in any other established Japanese Buddhist denominations. This phenomenon bears witness to the universal nature of the teachings of our two founders. By conducting international educational programs, Soto Zen contributes in an important way both to the influences Japan exerts on the rest of the world and to the influence rest of the world exerts on Japan. Even though active on the global scale, any religious group that is slack on education or has no audience for its educational efforts is likely to weaken and stagnate. For example, history shows that, in an ethnic melting pot like the United States, churches or temples targeted to specific immigrant groups, diminish with decreases in numbers of immigrants in that group. When new ethnic groups immigrate, they set up their own churches or temples. The population of Japan is foretold to drop below 100 million in 20 years. This means a reduction numbers of people subject to Soto Zen education. This in turn means fewer parishioners for temples throughout the country. The universal spread of our teachings outside Japan has much to teach us about how to conduct education at home. In 2007, we will commemorate the fortieth anniversary of the start of Deshimaru's mission in Europe. Therefore, we will hold the 40 years Commemoration Event of Soto Zen in Europe at the Temple Zen de La Gendroniere in France from June 8th to 10th, 2007. In this connection, we want to everything possible to promote zazen, not as mere seated meditation, but as religion. In Japan, Buddhist ceremony has become so habitual that some people regard it with skepticism. In recent years, Europeans, on the other hand, have come to feel a need for ceremony, which they look on as something refreshingly different. For this reason, we hope to devote ourselves to educational efforts to help general believers understand the nature of ceremony. This will call for still deeper reliance among European kokusai-fukyoshi, dendo-kyoshiand dendoshi and cooperative broader and deeper activities. Soto Zen activities today take place within conditions that differ from region to region. We must devise methods and programs that take into consideration differences in culture, customs and ways of thinking. Growing recognition throughout the world leaves no room for doubt about the universality of our two founders' teachings. Global-scale exchanges related to those teachings are essential to the cultivation of mutual understanding of regional characteristics, which will enable us to discover all kinds of new themes and refer them to local conditions. In this sense, dialogue among religions is essential. Inter-religion exchanges are in fact taking place. Nonetheless, ethnic and religious differences remain sources of conflicts like the Palestinian problem. Understanding founded on mutual exchanges among religions can build greater trust and contribute to worldwide peace. For clergy and laity to work hand in hand for the spread of Buddhism and the building of world peace is indispensable today and will remain indispensable in the future. As a traditional religion, we have a duty in this connection. We are aware of that duty. Participants for Soto Zen Conference of Europe.